PB finished his championship with multiple breed wins and two G1's. 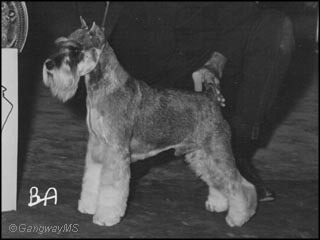 He was a multiple group and specialty winner and was among the top-winning Miniature Schnauzers in 1964. He was the sire of champions but his line survives into most of today's blacks and many salt & peppers through his daughter Kansho's Dinah. © Copyright 2005-2010 GangwayMS. All rights reserved.